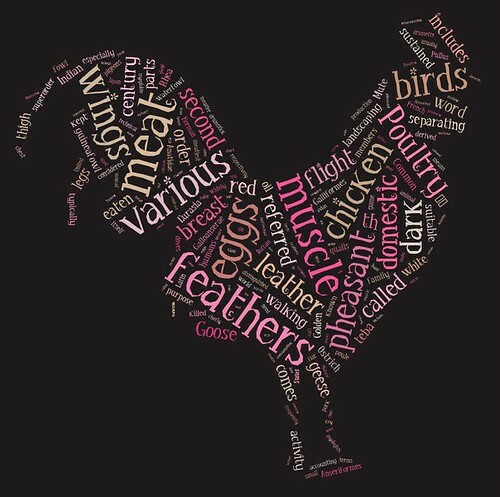 ILRI and other geneticists are closing in on ‘the wild chicken’ that became the world’s favoured barnyard (all illustrations on this page on Flickr by Susan von Struensee, Art and Agriculture Series using Tagxedo). ‘. . . A key thrust of research in the past decade has been to track the genetic changes that turned a remarkably shy creature into today’s meat-and-eggs dynamo, with an eye to protecting and improving breeds. 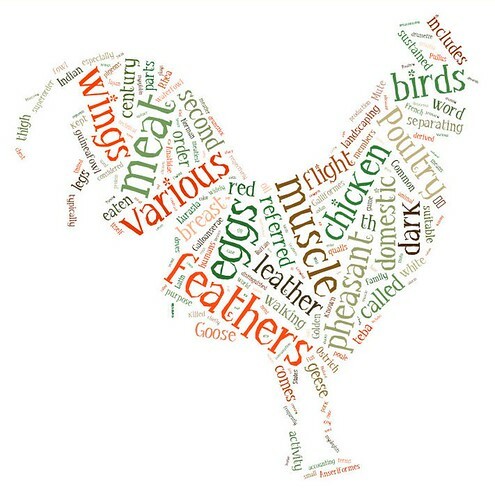 But this research has also given scientists the opportunity to unravel a long-standing mystery that fascinated Charles Darwin: Where, when, and how was the chicken domesticated? . . .
‘Researchers agree that the red jungle fowl gave rise to the barnyard chicken somewhere in South Asia. But they agree on little else. . . .
‘Identifying the chicken’s wild cousins and preserving their genetic diversity may one day prove critical for improving the stock, some researchers say. Genes from wild birds may help breed birds resistant to avian influenza and other illnesses, for example. ‘The red jungle fowl—Gallus gallus—ranges from the western foothills of the Himalaya Mountains to the tip of Sumatra. . . . . Unlike modern-day chickens, all roosters sport elaborate plumage, the females lack a comb, and both genders have thin, dark legs and can fly considerable distances. The fowl is also generally half the size of a White Leghorn domesticated chicken, but it can produce fertile offspring with domestic chickens. ‘Humans carried the easily portable bird around the world. How this began remains controversial. . . .
‘“We need to reconcile all the data,” says Olivier Hanotte, a geneticist at the University of Nottingham. He favors a single origin in northern Southeast Asia, based on the enormous diversity of chicken breeds there. . . .
‘Ultimately, researchers hope to get ancient DNA from well-dated bones. But “replicable DNA has been as rare as hen’s teeth,” Zeder says, thanks to contamination issues and tropical climes that degrade DNA. One team recently claimed to have mtDNA from an ancient Polynesian chicken bone in Chile—a dramatic find that would prove Polynesians reached the Americas before Columbus—but the find has been questioned as possibly contaminated (Science, 11 June 2010, p. 1344). Techniques are improving, however. . . .
[T]he genetic information in truly wild fowl could kill two birds with one stone, unraveling the chicken’s past while potentially ensuring its future. . . .
‘On a tidy farm in the mountains of northwest Vietnam, Chinese biologist Jianlin Han expertly grabs a nervous red jungle fowl recently captured in this region’s quickly disappearing forest. The bird—which sports a long and dangerously sharp spur—is part of Han’s hands-on effort to breed better animals to benefit the rural poor, while at the same time gathering a massive data set to understand the genetic underpinnings of the domestic chicken. Han, who grew up raising chickens in rural China, is as comfortable in the lab as in the barnyard. . . .
‘The chicken, which grows quickly and is the most intensely bred of domestic animals, provides an intriguing model for understanding those issues, says Han, who works for the International Livestock Research Institute based in Nairobi but spends most of his time in his Beijing lab and in the field across South Asia. . . . 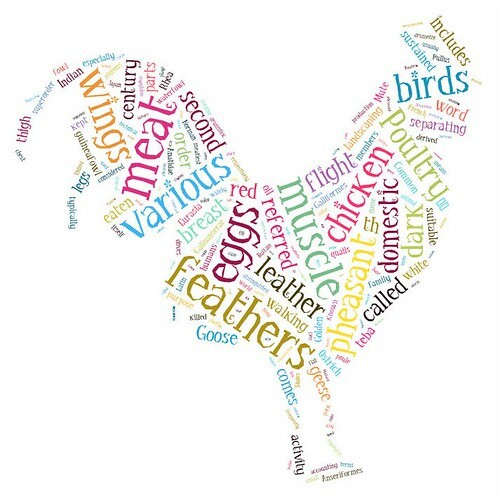 The goal is to produce a domes-ticated chicken that caters to local tastes while providing more meat and eggs. Han is also investigating the unusually high number of local varieties found in surrounding villages—many more than elsewhere in South Asia—which may be a hint that the chicken was originally domesticated in this rugged area. Han has an ambitious plan to catalog the genetic makeup of today’s jungle fowl, charting its diversity in different regions and also revealing whether it includes genes from domestic chickens. . . .
‘“Jianlin’s brute-force approach definitely has its merits,” says archaeologist Greger Larson of Durham University in the United Kingdom. “I suspect we can’t possibly know what all the variation is out there unless you go and sequence a ton of stuff.” Geneticist Olivier Hanotte of the University of Nottingham in the United Kingdom agrees . . . .
Read the whole articles in Science: In search of the wild chicken and the accompanying feature article on Han Jianlin, From farmyard to the lab (News Focus, Animal Domestication), both by Andrew Lawler, 23 November 2012: 1020–1024. 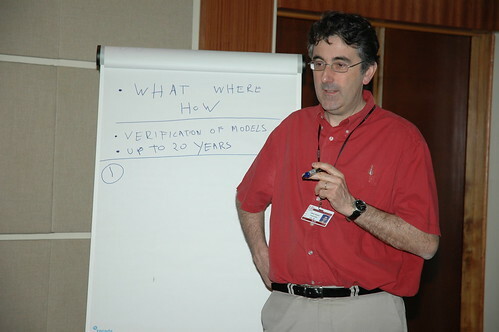 Read related earlier articles on this blog: Research paper casts doubt on claims for pre-Colombian Chilean chickens, 13 Oct 2008, and Award-winning ILRI geneticist takes up prestigious UK appointment, 17 Dec 2008.